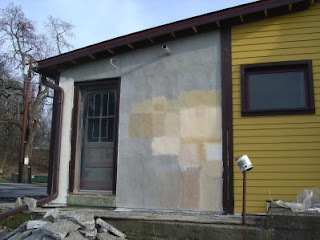 As the stucco has cured enough, we started sampling colors. We want to apply a pigmented lime wash, but doing a lime wash isn't as easy as buying paint at your local home improvement center. Depending on the ratio of water to lime, the result ranges from translucent to pastel. But we love this kind of experimenting. Else I was drywalling the short hallway to the bathrooms.